This new book from the world’s best-selling author of how-to-draw books shows readers how to create an entire cast of fascinating characters, including wizards that cast spells and summon spirits; hag witches, beguiling witches, and teen and girl witches; mythical beasts and characters such as dragons, gargoyles, unicorns, ogres and goblins; and wickedly handsome warlocks. Drawing Wizards, Witches and Warlocks takes artists on an amazing tour of the fantasy realm. Fantasy is an enduringly popular genre made famous in such books as Beowulf, The Lord of the Rings trilogy, The Chronicles of Narnia and the Harry Potter series—all of which have been adapted into blockbuster films. 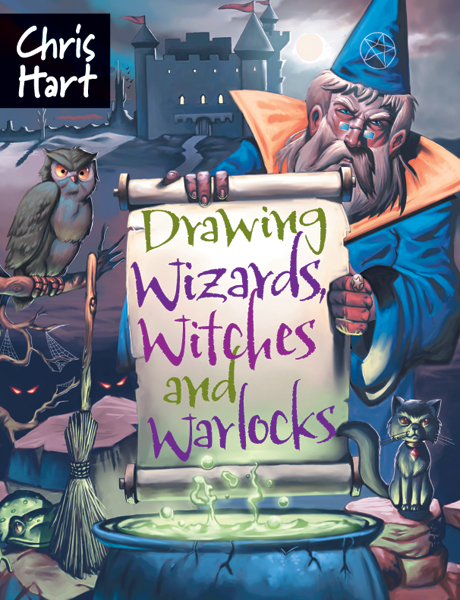 With hundreds of step-by-step drawings, expert art instruction, and tons of visual hints, Drawing Wizards, Witches and Warlocks is a crash course in fantasy art that will cast a spell on fantasy fans and artists of all levels.